It has been busy these last several days. I am still sticking with the workouts. I love that I can leave Priyasha at the kid scorner and not have to pay for a babysitter. She really looks forward to it and since she begs to go she motivates me to go and work out. My friends have already noticed a difference in the way I look. I cannot see it yet as I am so critical of myself but who isn't ? In addition to this new schedule Pravan is now in boys scouts. We have out first meeting this Wednesday and he is thrilled. Last week he came home with all the work for the week that was done in the classroom. He had his first math test and he got 100%. I was so proud of him. For the last two weeks the teacher has not been sending his homework back home after checking it. I was concerned until she told me that she keeps it hanging in the class as an example of neat writing. Pravan has exceptional handwriting and is the best in his class. I told him that I had the best handwriting when I was in school and clearly he wants to walk in my footsteps. I also told him that I did not always have the neatest handwriting and my classmates was better at times. I then had to practice more and then I got the best handwriting award. This in fact was a true story and I was surprised that he took it seriously. I may have to tell a tall tale about some stuff to get him to succeed as I was not the best at everything especially math. I hated math and he loves it but I will never tell him how I felt about math. I am ready for a very busy week ahead of me. Tonight is the premier for desperate housewives. I am so excited and have some scrap projects waiting to be worked on. We are having Salmon and corn on the cob and almond rice for dinner. Yum Yum ! We usually have this as a meal whenever I go to Costco. I was able to get an awesome deal on a baby doll set for Priyasha. I will hold onto it until Christmas. Since July I have been talking about Santa to her. Last year she was terrified of the guy and screamed her lungs out. SO this year I am preparing her for a better experience. When she see stuff she says " I want that for Christmas. Santa is a good guy and he gives me treats. I sit on his tell and tell him I want that " It is the most adorable thing out of her mouth. We'll see how she does. 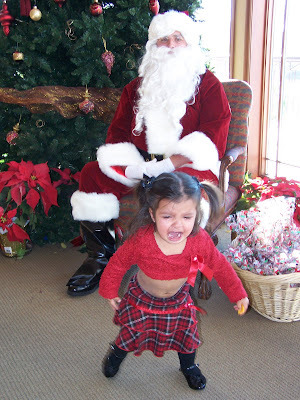 Regardless she will sit on his lap and I will get that picture of her screaming. That's what we moms do. 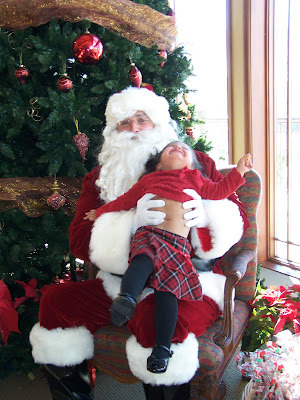 I guess some don't but hey it is mean for the kid to not visit Santa. I even have one picture of me somewhere in Africa sitting on Santa's lap. I did not even celebrate Xmas. Okay that's it for today. Hubby just left with the kids to the pool. Yes the pool. It is 90 degrees today and it is the last day for the pool to be open for the season. I am going to clean my scrapbooking room. Yeah peace and quite in the day time. It is a miracle. 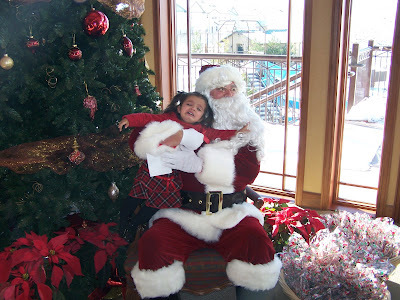 Here are some pictures of Priyasha with Santa. She ran as fast as her little legs could take her. I had the camera in burst mode. Some are blurry as I was laughing and it happened so fast. 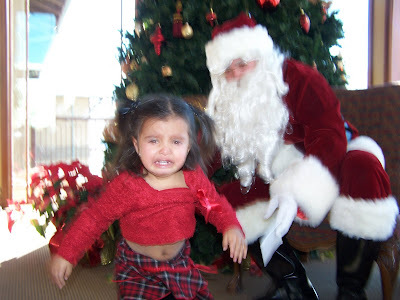 Remember I told Santa not to let go no matter how much she cried. I think he did the best he could so I could get a picture. Well I got many and they are great even if she is screaming. This christmas it should be better. Take two : We took a break. We had milk and cookies and tried again but the results weren't any better. 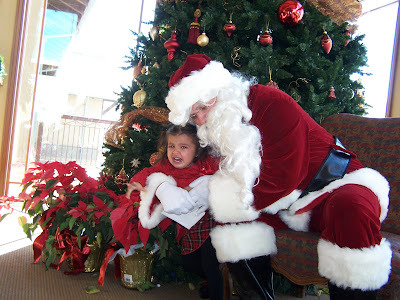 I think it will be great to see what my grand daughter will do at age two with Santa. Clearly Santa was done. He does a prod look on his face. Well he listens well. I am sure he will not be thrilled to see us again this year. Hi there! Funny! I think my girls freaked out around that age with Santa...but Ajay was ok...he never cried. It is best to prepare them I think..and no matter how they cry..I think it is necessary to get that picture:) Good Prevan with his handwriting and math test! Oh my...I still am sitting on your email...I will sure respond back soon!